Jay Gatling caught the magic bug at the tender age of 10, and continued to follow this path for many years, honing and advancing his skills. He was noticed by a local promoter in 2008 and thus his professional career began when he was given the opportunity to perform in a classic seaside variety show; he performed in the show for six years, each year being brought back by popular demand. Since then he has travelled around the country, amazing and astounding with his personal brand of magic. Jay is a member of Equity, as well as the North Wales Magic Circle, and the British Ring of the International Brotherhood of Magicians. Performing with his partner Sarah, their act Elemental has won awards on both national and local levels; these include the prestigious Dittia Shield for Manipulation and the Theo Speaker Cup, both awarded to them by the International Brotherhood of Magicians. 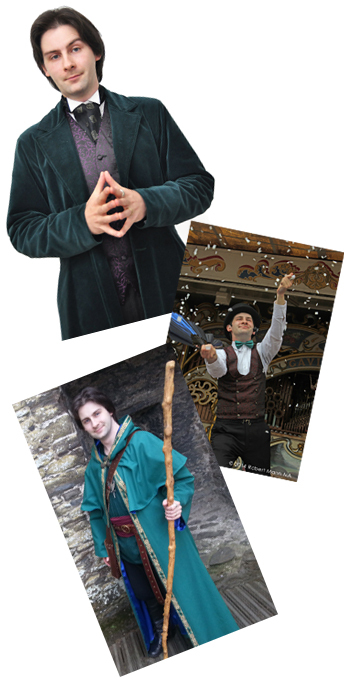 Alongside his love of magic Jay is also a trained H.E.M.A swordsman and travels the length and breadth of the UK along with his sparring partner Erwyd le Fol, performing as part of the street theatre duo Two the Hilt.